PM Nguyen Xuan Phuc has just asked the Ministry of Construction to deal with complaints about construction violations in the Trung Hoa-Nhan Chinh Urban Area. 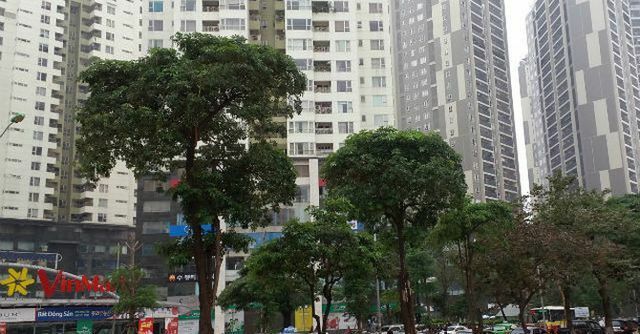 Residents at the Trung Hoa-Nhan Chinh New Urban Area complain about the lack of space as new apartment buildings kept being added in the area over the past 10 years. According to a document sent from the Government Office to the Ministry of Construction, more than 700 households at the Trung Hoa-Nhan Chinh Urban Area in Thanh Xuan District have recently filed complaints to the media about the investor's continuous construction violations which have affected the design of the area over the past 20 years. Meanwhile, the investor, Vietnam Construction And Import-Export Joint Stock Corporation (Vinaconex) has continued to submit a plan to build an 18-storey office building. The PM asked the Construction Ministry to consider the complaints by local residents before issuing the construction permit to Vinaconex. The Trung Hoa-Nhan Chinh New Urban Area was put into operation in 2006, which was at that time seen as the ideal urban area model of the capital. However, residents have recently complained about the lack of space as new apartment buildings kept being added in the area over the past 10 years. According to a plan approved in 1998, the Trung Hoa-Nhan Chinh New Urban Area had construction density of 34.88% with eight buildings of between 6.7 and 7.5 floors. The plan was adjusted in 2001 with 16 buildings of between nine to 21 floors. And after many adjustments, construction density in the area now is over 50% with 16 buildings of between 17 and 34 floors. Local residents have sent complaints to local media when Vinaconex announced a plan to build a new 18-storey building on a 4,300-square-metre in the area, saying that this would put more burden on the already crowded area and Le Van Luong Street. In a regular meeting of the Ministry of Construction held on April 9, a representative from the Department of Planning and Architecture said that all the adjustments were approved by the city people's committee with the consent of local people. Head of the department, Tran Thu Hang said that the planning of high-rise buildings in Hanoi has recently attracted lots of attention from local people. "We have sent reports to the Hanoi People's Committee on all the construction of all the projects approved by the committee, and the agency which approved the plan should be held responsible for any violations."